For a Columbus appliance disposal service that is both fast and affordable, At Your Disposal Hauling is the one you should call! From dehumidifier disposal to refrigerator removal, we dispose of large appliances and small. Unlike larger companies that pick up old appliances in Columbus, Ohio, we have no waiting list. A small, local business, we haul appliances the same day you call. Why not call now? 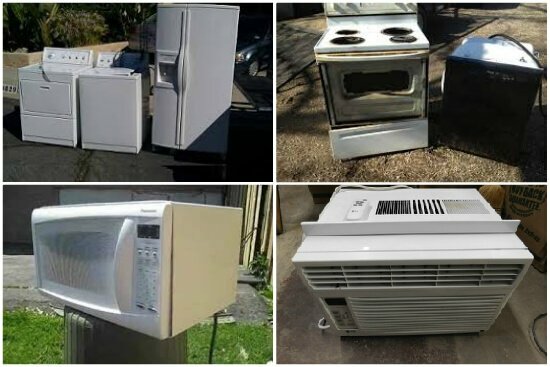 Getting rid of appliances couldn't be easier! We take your old appliances! Not only does At Your Disposal Hauling remove unwanted appliances from your home, but we also offer commercial appliance recycling services too. We take them all! Regardless of where you need appliances hauled away from, our safe and efficient crew is on hand 6 days of the week to take them off your hands. Book now, and we’ll show up onsite within a few hours. Like clockwork, our expert appliance haulers will show up with everything needed for a quick and safe removal. Just point, step back, and they’ll handle it from there. Your presence isn’t required for us to haul appliances away from a driveway or curb – just let us know when the machine is outside. We’ll do the job and then collect when you return. Refrigerators and dehumidifiers contain refrigerants – improperly disposing of these types of appliances is harmful to the environment. 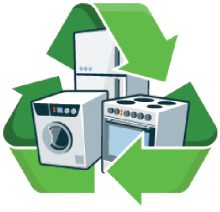 As an eco-friendly Columbus appliance removal service, we never take appliances to the landfill. Instead, we recycle appliances at licensed metal scrapyards. Proof of proper disposal is available upon request. 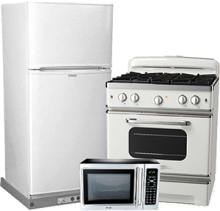 Contact us today to get appliance removal prices or to schedule a pickup!